I used to think Kinect was cool, until I recently stumbled upon Leap. The video below shows, a demo of Leap. Leap happens to be not only cheaper , but also more accurate, powerful and smaller. The Leap uses a number of camera sensors to map out a workspace of sorts — it’s a 3D space in which you operate as you normally would, with almost none of the Kinect’s angle and distance restrictions. Currently the Leap uses VGA camera sensors, and the workspace is about three cubic feet; Leap CTO David Holz says that bigger, better sensors are the only thing required to make that number more like thirty feet, or three hundred. Leap’s device tracks all movement inside its force field, and is remarkably accurate, down to 0.01mm. 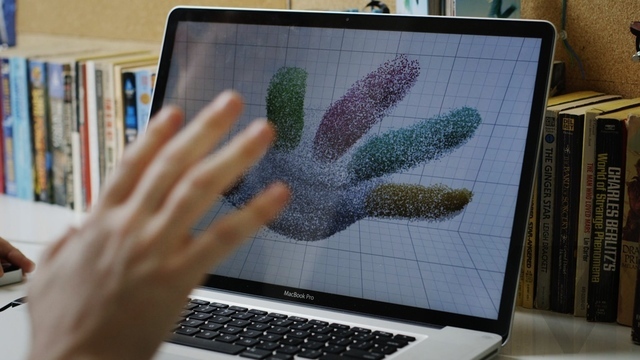 It tracks your fingers individually, and knows the difference between your fingers and the pencil you’re holding between two of them. The simplest thing it can do is simulate a touch screen, so you can interact with any display as if it were touch-enabled — you can start slicing pineapples in Fruit Ninja in seconds, without a moment of extra development or additional software. Developers that do take advantage of the Leap’s SDK will be able to do much more, however, and the possibilities appear to be limited only by your imagination. All kinds of different apps are being developed: some could improving remote surgery, others allow easier navigation through complex models and data, and others might put you square in the middle of a first-person shooter. It’s like holding the Mario Kart steering wheel, but on a whole new level. Rather than mapping particular gestures (cross your arms to close the app, draw a circle to open a new window), Holz said developers are being encouraged to provide constant dynamic feedback. No one needed to be taught what pinch-to-zoom meant — it’s the natural thing to try and do on a touchscreen, and as soon as you start pinching or spreading it becomes clear what happens. That’s the paradigm for the Leap, Holz says: you should always be able to just do something, and the app or device should respond. The Leap is about the size of a USB drive, but Holz says it could easily be no larger than a dime, so adding it to a laptop or tablet shouldn’t be difficult. With a small Leap into the future, we might all be waving our hands infront of our screens rather than swiping and tapping them. This article is written by Devang Agrawal with some inputs from Parth.